This is a massive list. It is not sorted properly, partially because it is very difficult to sort suppliers appropriately. The best way to learn about all these suppliers is to visit them all in turn and get a feel for them. The only way a supplier makes it onto this list is because it was recommended by a friend of mine; they are all legit. I have tried to put the larger suppliers toward the top of every list but I have not entirely succeeded at that. http://www.alibaba.com/ The official channel to find and buy from Chinese sources directly pretty much anything you can buy from China. Good luck. http://www.slack.com/elec.html Manuals and resources for lots and lots of older test equipment like oscilloscopes, signal generators, counters, and the like. http://www.robotmarketplace.com Robot Marketplace sells... robot parts! http://www.bmius.com/ A real industrial surplus company. Used fancy scientific equipment and such. I haven't bought from them. http://www.bgmicro.com/ a good electronics dealer. On 1-20-12 SWARM bought 15 gently used Yuasa 7ah batteries from them for $10 each delivered. :-) Tammie at BG Micro went the extra mile and emailed Lee, nicely suggesting the cheapest shipping option after the order had been completed. USPS Priority was cheaper than UPS for these crazy-heavy items. Al Lasher Electronics in Berkeley. Old school nerd haven. Radio Shack. They're everywhere and those cabinets in the back of the store can have a key item you need. Central Computer, downtown SF. They have lots of inexpensive general computing stuff.. hard drives and the like. http://www.hobbyengineering.com/ in South San Francisco. "A supply store for people who want to build robots, electronic gadgets, kinetic art or anything else that moves, beeps or flashes." Alameda County Computer Resource Center. Until 2010 this was a good place to hunt through e-waste in Berkeley. Now in 2011 the status isn't known. James Burgett is no longer involved with ACCRC, and the building in Berkeley once filled with stacks of awesome equipment is no longer rented by ACCRC, instead they only have a parking lot at 620 Page St staffed with hourlies accepting e-waste into shipping containers for the appropriate fee. ACCRC still has a larger facility in Marin, but I have never been there and can't say what it's like. Digikey One of the big boys of electronics parts, hundreds of thousands of parts. Good online catalog, though can be hard to narrow down your choice. Newark Electronics One of the big boys of electronics parts, hundreds of thousands of parts. Jameco A smaller catalog, designed to be easier to sort through at the expense of (mind boggling) selection. Sparkfun great electronics parts store for hobbyists and then some! http://www.waytekwire.com/ for wires and related stuff. I haven't bought from them but they look good. http://www.alltronics.com/ Alltronics -- Mail order place from Morgan Hill. Sometimes odd pricing ($5 for a blue LED? $25 for a Tek storage scope?) but seems to scavenge the semiconductor industry and you can find stuff there you won't find elsewhere. 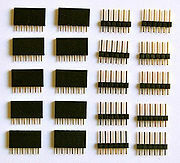 Hosfelt Electronics - mail order parts, sometimes pretty cheap. In Ohio. Daniel Freschl: Does anyone know a good source of stackable headers? Digikey has the perfect part ( 2-173145-8-ND ). Unfortunately this is a non-stock part and the minimum order quantity is 1,300 units. I hate that. Jeff Keyzer: I would probably order these from 4UCON, but they also have 1000+ minimum order on most parts. There's probably a 26 pin version on their site somewhere. The nice thing about ordering 1000 headers is that you won't have to order more for a while. Oh, and the price will probably be less than 1/3rd of what you would pay at Digikey. Joe Grand: Try Samtec (http://www.samtec.com). They offer quick turn free samples, as well. Anders Nelson: You could also use SMD pin headers. When I ordered stacky headers, 4ucon's lead time was over a month for 1k each of 1x6 and 1x8, so budget time for this. Also, their quality was good, but the design is pretty meh. The pins themselves are flat, stamped forks, not the solid square things most people associate with pins. There was a nice site with images of the different styles of female header mechanisms, but I can't seem to find it. David Rorex: I get pin headers in general from ebay, super cheap. Don't go to digikey, they are way overpriced there for some reason. Downside to ebay is you might wait a couple weeks for shipping from china. https://1000bulbs.com/ LED rope lights, CFL, neon, every type of lighting! http://digikey.com/lighting - Here is a resource that, while possibly overly technical, gives ALL the answers about electronic lighting. Check out the “Product Training Modules” on the page too! This list lifted from the excellent Celestial Audio site on 4-11-10. Go to that site for a more updated list! Celestial Audio manufactures hardware for dimming control of LEDs through DMX. Low-current DC supplies for use with the DMX48 - either cube plugged into the wall style "wall-warts" or laptop-style "tabletop supplies" - can be obtained from many places. Note that inexpensive "wall warts" may have an unregulated output, the the output voltage can be several volts higher than specified. These are not recommended. LED sources - LEDs are available in a fairly incredible variety of form factors and power levels. Creating LED lights from single LEDs requires a bit of knowledge of forward voltage drop range, current limiting, and series/parallel wiring. There are numerous pre-made LED lights that run directly from a specified voltage (often 12V), for these just hook them up and go. If you have a particular LED you'd like to use, email for advice. LED resistor calculator - Super handy! Variety of links, FAQ, sources, etc. DMX equipment sources: computer interfaces, software, standalone DMX players, consoles, etc. DMX technical : wiring, recommended practices, etc. Colson Caster Wheel company has every kind of high quality caster wheel imaginable. Used by Mecha-Catbot and other Combot competitors. Make your own gears out of "spur gear rods" from McMaster. http://www.metalsupermarkets.com in Hayward, Redwood City and online. http://www.onlinemetals.com/ - Pretty convenient and the shipping isn't too bad. San Francisco, CA 94124 - Their selection is not incredible, but for typical round and square tube sizes in mild steel, they should be fine. Last I checked, they don't accept credit cards. They will deliver in SF. Not all of their staff speak English, but it usually doesn't take too long to find someone who does. http://weldingsupply.com sells aluminum TIG electrodes and other items at 1/5 the price of Praxair and Airgas. Yeah, $5/lb instead of $25/lb. Lee is very happy with all his purchases there including The Box Shop's TIG welder in 2007. Note that it can take 10 days for products to arrive by mail. Sculpt Nouveau is a defacto place to get lots of chemicals for metal patinas. Located in southern California. Art Chemicals is the other defacto defacto place for metal patinas. Located in San Leandro, California. Sa 8-11	Decent collection of sheet, tube, square, etc. But the pricing is quirky - they seem to charge whatever the guy running the scale feels like. M. Maselli & Sons, Inc.
Mo-Fr 7:30-5, Sa 7:30-12	Nearly 6 acres of scrap & hardware. Great place, well organized. Good source of hardware also. Open Saturdays until noon. Somewhat expensive for scrap, but perhaps worth it for the organization, help, cleanliness of the place. (map)	Big steel yard. They sell new steel only - most if it's in 20' lengths, so bring a big truck or a saw. They charge $7.50 a cut if you need it. They have a small selection of welding supplies also. They seem somewhat gruff dealing with non-trade, non-pro; so know what you want before you go there. no longer sells scrap metal to the general public. (map)	Chain of franchise stores. Good source of specialty forms, sizes & alloys. (map)	Chain of franchise stores. (map)	Membership-based workshop with monthly/annual membership fee. Full access to all machines and facilities with membership. (As of 2009) Full metal and machine shop with two 175 amp MIG welders, one 200 amp TIG welder with two welding stations. Safety and basic use class required ($45) before you can use the equipment. Additional instruction is available for $80 for a two-hour class. Community focus in on "DIY" projects, shaped by "Make" magazine. (map)	Course-based workshop space. Offers classes in MIG, TIG, Oxyacetylene welding & metal fabrication. You need to purchase a course to use the machines, after which you can purchase "lab time". Memberships available, which give you a discount on the classes. Classes are $375.00 for a 16-hour course, either two weekend days, or 5 week weekday evenings. Community focus is on metal and fire art, shaped by "Burning Man" projects. (map)	Offers welding courses for $55 a credit hour. Open lab for current students. Best value in instruction. Community focus is on preparation for a professional welding career. Apex Electronics north of Los Angeles. Gregory MacNicol says he can spend a whole day browsing there. Tiny to giant electro and mechanical junk. Maselli's in Petaluma. Hardware store in front; huge surplus yard in back and metal shop in the middle. Dynamixel AX-12+ Smart Serial Servo - It can be used to sense position too! As used in the MORAV Mech Telemetry suit! Sparkfun AT936B (this model retired, replaced by Sparkfun Soldering Iron Variable Temperature 50W) - $40 cheap! for a high quality temperature controlled soldering iron that comes with a pointy tip great for thru-hole and smaller electronics work. Lee bought one of these for The Crucible's Kinetics Department November 2011 and it has stood up to a year of use and abuse for almost a year now and still looks great. We'll be getting more. It is a quality knock-off of the Hakko 936. Stahl Tools STSSVT Variable Temperature Soldering Station $15 - The Crucible Kinetics Department uses these as our workhorse irons. They work pretty good but start to fail (tips go bad, don't heat evenly) after a while (mostly because they aren't temperature controlled). We'll probably slowly replace them with the Sparkfun 936B. Weller WES51 $100 - Lee has this quality, name brand, temperature controlled iron and is very happy with it. Franciscan Hobbies 1920 Ocean Ave, 415-584-3919 http://www.franciscanhobbies.com/ . Model planes, trains and cars, balsa wood, motors etc. In business since 1946. These folks supply premium wood like veneers, exotic, etc! Sticker Giant has done all of our SWARM stickers and they have come out terrific! Mitch Altman recommends Jak Prints for stickers. I see they do a groovy printed-all-over shirts too. Getting things to stick to one another in extreme environments is a tricky science. That's why you should call the 3M Adhesives Hotline at 800-362-3550 7a-5p (http://solutions.3m.com/wps/portal/3M/en_US/Adhesives/Tapes/Support/Contact-Us/). Adhesive engineers are standing by! Lee used http://mpix.com and was very happy with the quality, price and ease of using their web site. He found the http://www.whcc.com web site hard to use (it'd probably be better for professional photographers). http://photoworkssf.com/ is on Market St. They can do quick turnaround (order online to get a discount). They cater to the "pro-sumer" market. Lee and Charlotte used them for the FLG photobook and the photos came out very well. David Ellsworth writes: I've heard good things about http://www.mpix.com and http://www.whcc.com. If you want cheap, http://www.perfectposters.com and http://www.reliablephoto.com have low prices for big prints in their ads in the latest Pop. Photo magazine. I've been happy with Costco, which has the advantage of 2 hour turnaround, but you need to be a member, and they only go up to 8x12 or so. Don't forget to make small enlargements to sell, too. They sold well at the last fundraiser. Calypso Imaging in San Jose does a good job, but they are pricey. Picture frames from Ikea is good. This page was last modified on 15 February 2017, at 12:58. This page has been accessed 104,227 times.